The Golden Retriever is a highly intelligent and extremely sweet dog. They are very devoted to their family and always eager to please. However, they can also be very mischievous and destructive if left alone for an extended period of time. It is medium to large in size, very energetic and extremely beautiful. Another attribute of the breed is that they are very active and love water (characteristic of their hunting heritage). Although the Golden is previously known for its hunting and retrieving capabilities, it is best known today for being one of the most popular family dog breeds. Golden Retriever dogs owe their origin to Lord Tweedmouth, the Scottish/English noble whose goal was to produce a hunting dog that would be easy to train, loyal, kind and energetic. As a result, Lord Tweedmouth first bred Nous, a yellow wavy-coated retriever to Belle, a Tweed water spaniel. Nous and Belle first produced a litter of four pups. Subsequent breeding included black retrievers, Tweed spaniels, bloodhounds and setters. In 1912, the breed was finally recognized as Golden Retriever and in 1927, the AKC registered this breed. 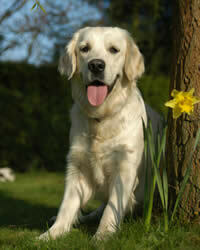 Goldens are known for their obedient and devoted nature and they make wonderful family dogs. They are very friendly with kids and other pets. Because they love “everyone,” they do not make very good watchdogs. Human companionship is essential for Goldens to be happy. One annoying habit is their tendency to bark when greeting someone (they just want to say, “Hello”). This gentle, intelligent dog breed also makes a great guide dog. And as their name suggests, they love retrieving. Throw a ball, stick, Frisbee® or just about anything, and they love to retrieve it. Playing “fetch” can keep them entertained for hours. Living Environment – The Golden Retriever loves the outdoors but they are family dogs that need constant family interaction. They do well in large homes but they also do well in apartments, provided they are given plenty of exercise and mental stimulation. Diet & Exercise – An overweight Golden is not uncommon, so you must be careful not to over feed them. Daily exercise and play sessions will help to manage their weight. Daily walks are a must for ideal fitness and health. lead to longer, healthier lives. Golden Retriever dogs are very fast learners. Even an inexperienced owner is capable of training this breed. Proper and timely training should start the moment you bring your new pup home. Remember to reward them with lots of praise, treats and kisses when they learn a new trick or command (OK, not everyone likes to kiss a dog! ).